Freeze-fracture replica of the unicellular photosynthetic prokaryote Prochloron showing the distribution and size of particles on cleaved thylakoid membranes. 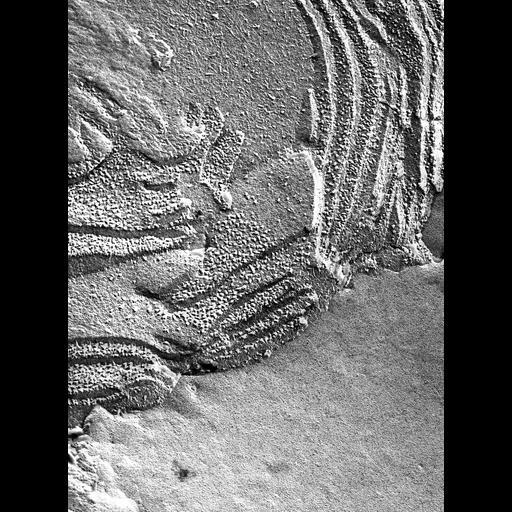 This image group includes many other freeze-fracture images of Prochloron. See also: Giddings TH, Withers NW, Staehelin LA.1980 Supramolecular structure of stacked and unstacked regions of the photosynthetic membranes of Prochloron sp., a prokaryote. Proc Natl Acad Sci U S A. 77:352-3566. Prochloron was collected at Coconut Island, Oahu, Hawaii. Green colonies of didemnid ascidians, Diplosoma virens, were collected from shallow waters. Green spherical cells, identified as Prochloron, were released from the ascidians by gently pressing on the colonies while flushing the surface with sea water. Cells were centrifuged, then rinsed in filtered sea water fixed with glutaraldehyde, infiltrated with glycerol and vitrified. Samples were fractured and replicated using a Balzers BA 360 freeze-etch device and examined and in a JEOL 100C TEM at 50,000X magnification. Images were recorded on film and digitized.